Canaan Valley extends north from the slopes at Canaan Valley Resort. Photo courtesy Canaan Valley Resort. 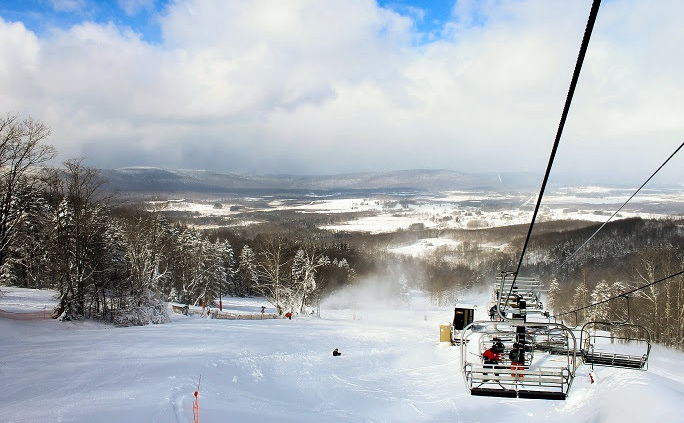 The slopes at Canaan Valley Ski Area, located at Canaan Valley State Park, look northward across the Canaan Valley and the vale of the Blackwater River, an outdoor-recreation destination that the resort shares with two other ski areas and a national wildlife refuge. Part of Canaan Valley Resort State Park, the ski area has been attracting vacationers to the valley since the 1970s. The ski area descends from Weiss Knob on Cabin Mountain at 4,280 feet above sea level and includes 47 trails and downhill ski slopes, a quad lift, two triple lifts, and two magic carpets, as well as a terrain park and ski school. The resort includes restaurants, lounges, and conference facilities and invites guests to stay overnight at its new 250-guest room lodge or in any of 23 cabins. Help us build our guide to skiing at Canaan Valley Ski Area and other ski areas in West Virginia. We’re continually looking for contributors. For more information, contact a member of our editorial staff.